So I'm proposing that we start with that, erase everything but the Visitors' Center and Mount Sibo (so that we may have some reference points between the two films), and then edit the geography to accommodate for the geological changes that occur to the island in between the films. 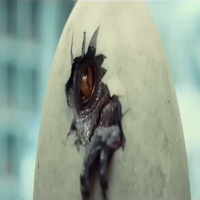 Then, add in everything from Jurassic World with its own logos and such. 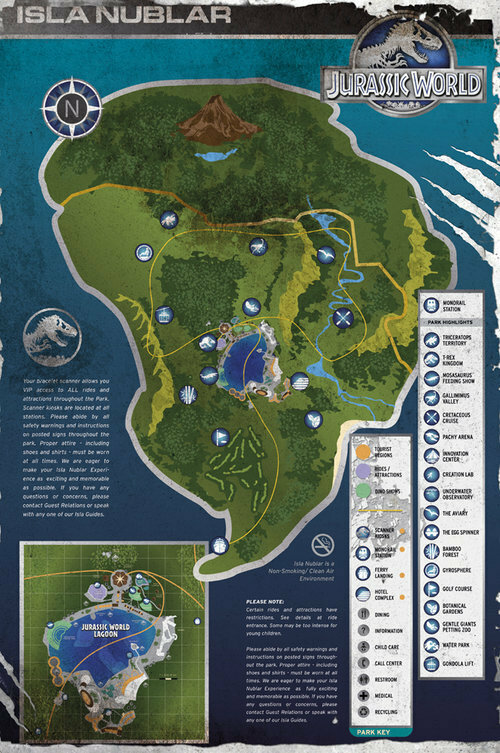 To determine the locations of the Jurassic World features I present the film-canon maps of Isla Nublar circa 2015: first, the map from the website. Note that it is highly stylized and cartoonish, intentionally making the area north of the Wall (Sector 5) appear smaller than it is in reality. Also, it's important to note that the old Visitors' Center--commonly thought to be within Sector 5--is NOT in Sector 5, it's in Sector 4! This map is reasonably accurate and gives a pretty good idea of where the monorail and transport roads are, as well as a number of other features. However, the labels for Sectors 5 and 6 are swapped erroneously here. That's a mistake; Sector 5 is the northernmost sector, whereas Sector 6 is the one east of the Jungle River. Unfortunately, high-resolution images of this map are very rare. The best I could find was this prop replica on eBay, which shows a few buildings not on the other maps: the Events Center, Zipline Towers, Rock Climbing, and Security. If anyone actually has the brochure in their possession, and could upload some pictures, that'd be cool of you. Finally, the Control Room map. Sadly there are not a lot of high-quality pictures of this one either. But we do get to see some other features in the park: the Weather Station is given a proper location (the hurricane-shaped icon on the coast), we see a Lagoon Outflow (also on the western coast), a Water Power Generator (the lightning-bold symbol on the coast), the Sudden Drop (cliffs on the eastern coast of Sector 6) and the Western Ridge (a mountain range in the west). 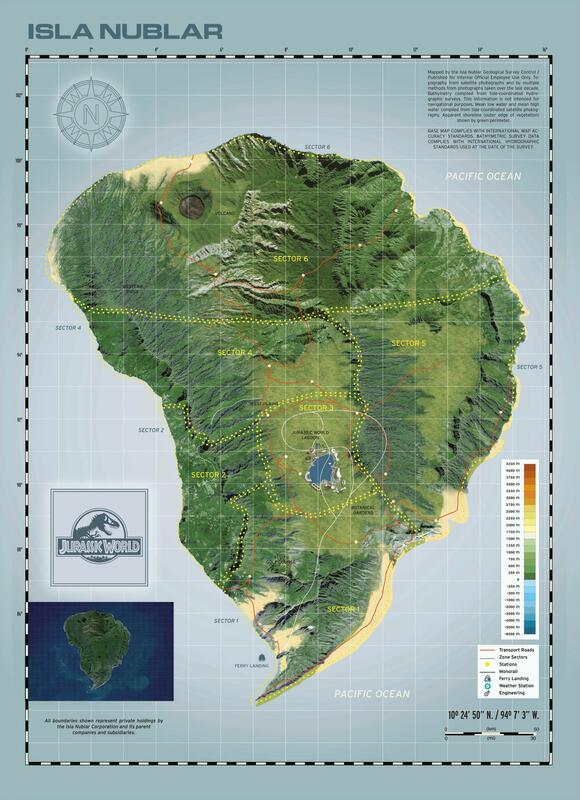 There are a LOT of other labels on this map, and if anyone can at all find a way to make them visible, through whatever technological wizardry you have access to (or bribing Trevorrow into giving us a closer look at it, that works too), that would be AWESOME. ...There are probably more, but that's what I've got for now. Along with these there are the locations which appear either in the film itself or on the various maps. According to the website, there are 37 shops on Main Street, along with 12 sit-down restaurants and 8 cafés, and the video cameras on the website indicate the existence of a minimum of six maintenance alleys and an employee break room (appearing to be located off of a maintenance alley). I'm thinking Main Street and the lagoon should have a zoomed-in inset area to view more clearly, as in the brochure map. If anybody else has found things that should be mapped, feel free to post them. The days of JPL may be over but that doesn't mean that what's left of us can't create some damn good maps. Visit the lovely Second Earth! That brochure is only $20...? I can buy that right now and have it by Wednesday. Sweet! Hopefully we can get this underway soon. Sounds like an excellent venture, I look forward to the finalized results!! Perhaps we can finally solve the mystery of that sharp, jutting peninsula at the southern tip of the island. My best guess for that region is that rising sea levels have swamped all but the highest of ground in the south, turning the formerly broad and rounded area of the island into a tidal marsh with only a narrow area of land exposed to air all of the time. This, along with erosion and a lesser degree of human interference, has resulted in the current structure of Isla Nublar's southern tip. The monorail tracks on the prop map don't match up with those on the website map, so I'm using the website monorail track map rather than the prop map. The problem with the prop map is that the tracks never leave Sector 3, whereas in the film, they clearly do. As of now I've altered the outline of the island (keeping as close to the original as I could), including the estuaries of the Jungle River and North River. The distortion of Sector 5 in the website map is especially apparent when I mapped the North River; it extends to about the same longitude as Mt. Sibo, which is over halfway across the sector. The distortion makes it look like it's small, but it actually extends quite far into the island interior, even farther than it did in 1993, probably due to erosion of the mountains. I tried to keep the Jungle River estuaries relatively near where the original estuary was. In addition, the Lagoon is situated on top of where some of the Jungle River used to be, strongly implying that the River is the Lagoon's source of water (treated with salt by JW staff, probably). I've also added the monorail track, other bodies of water inland, sector boundaries and walls, and service roads indicated by the prop map. I have drawn on a basic layout of the buildings around the Lagoon, but they'll be overlain by icons as per the original JPL map, so they're just placeholders at the moment. I have yet to create any new icons, that's the next order of business. Hey! Sorry if I'm a bit late, but is there a chance I could join the project too? Sure, if you have anything that would help identify the locations of particular areas (or skill with Microsoft Paint!) that would be great! Any news in this project?? ''Mankind is poised midway between the gods and the beasts, that may have been true in Plotinus time, but clearly we've fallen quite a way since then."